Chuan Body + Soul spa entrance at Langham Place, New York, Fifth Avenue. 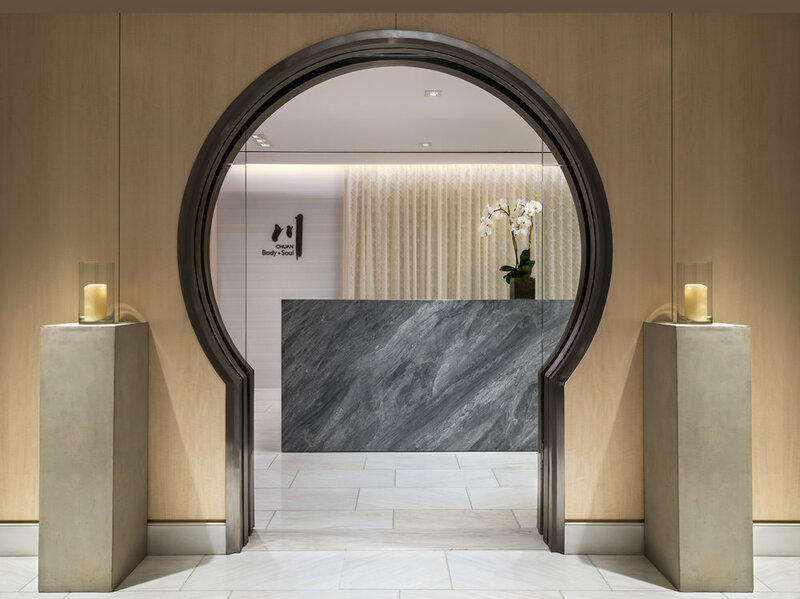 Situated on the fourth floor of the Langham, New York on Fifth Avenue, is the Chuan Body + Soul Spa, a full-service respite, a zen discovery hidden from the madness of Midtown. After the complete overhaul of its 4,000-square-foot space, the totally reimagined spa environment was revealed in the fall of 2015 and has been a tranquil sanctuary for city dwellers and visitors ever since. Drawing on the principles of traditional Chinese-medicine energy, three of its five elements serve as treatment-room names: Wood, Earth, and Metal (the other two being Fire and Water). Just in time for the fall mayhem as well as for New York marathoners, four new signature treatments are being featured in them, created exclusively for the spa by science-based natural skincare line, Comfort Zone. I was lucky enough to experience one, the Tibetan Sound Massage. While facedown on a massage bed, the treatment started with my inhaling of their signature blend of essential oils, and then three Tibetan singing bowls of varying sizes were laid in a row on my back. The therapist proceeded to gently sound the bowls, their trembles sending vibrations onto my body, immediately transporting me into a meditative state. I found this massage treatment to be thoroughly relaxing and calming, yet, afterward, I was motivated thanks to the well-harmonized combination of senses and physics. It is a very well-designed sensorial journey. They say it’s the power of the sound of the bowls’ seven-metal alloy that creates the effect of sound circles that seem to expand. This “singing” vibration enters the body and resonates down to the cells for up to 72 hours. Um, yes, please! May I come for this treatment every 72 hours? Sigh, a girl can dream. A couple’s treatment room at Chuan Body + Soul. There’s also the Eastern Elements Ritual, a treatment that is drawn from Chinese Tui Na and harmonizing Indian Ayurvedic practices. The revitalizing Shiatsu method is applied, to align one’s energy points. The Sacred Nature Ritual is a unique blend of Esalen massage and Bioenergetic Massage & Shen Touch, and it is recommend for pre-natal clients. And the Urban Longevity Facial is geared toward revitalizing and hydrating the skin, to restore the cellular breakdown caused by environmental pollution and aggressors, which cause premature aging. It’s recommended for both women and men. It’s a good thing for those folks in Boston, Chicago, and Pasadena, where the Langham sister properties are located, as these Comfort Zone treatments will be a permanent addition to all Chuan’s spa menus. Aside from these beautiful treatments, let’s not forget about the definitive spa house menu, which offers a full range of beautifying methods, from signature body treatments to massages to various facials, as well as feet-retreat therapies! And then there is the Himalayan salt wall in the sauna, where I could have stayed all day. Salt rooms are known to be beneficial to those who suffer from asthma or allergies, and they help to boost one’s immune system by breathing in salt air. If you’re not a frequenter of saunas, though, the spa offers treatments that include salt scrubs and salt hot stone massages. Can you say heavenly? Salt wall lined sauna at Chuan Body + Soul. And that’s not all! If you happen to be a marathoner, the New York spa location is offering a discount! Simply present your registration or your bib number from any of the upcoming charitable walks or runs held throughout the five boroughs of New York City—including the New York Marathon and its qualifying runs – and receive a 20 percent discount on all feet treatments and various body massages from the full spa menu, Comfort Zone treatments included! Well, there’s another good reason to run to this spa. The word chuan means a serene course of water, which is actually featured at the spa. I found the uniquely designed and displayed waterfall thoroughly calming and mesmerizing. So, if you are in need to recharge or recover, Chuan Body + Soul Spa is very much endorsed. Lounge area at Chuan Body + Soul.